BRAND NEW COMPLETE PAINT JOB, FRESH BOTTOM PAINT AND COMPLETED SERVICED, READY TO ENJOY NOW!!! 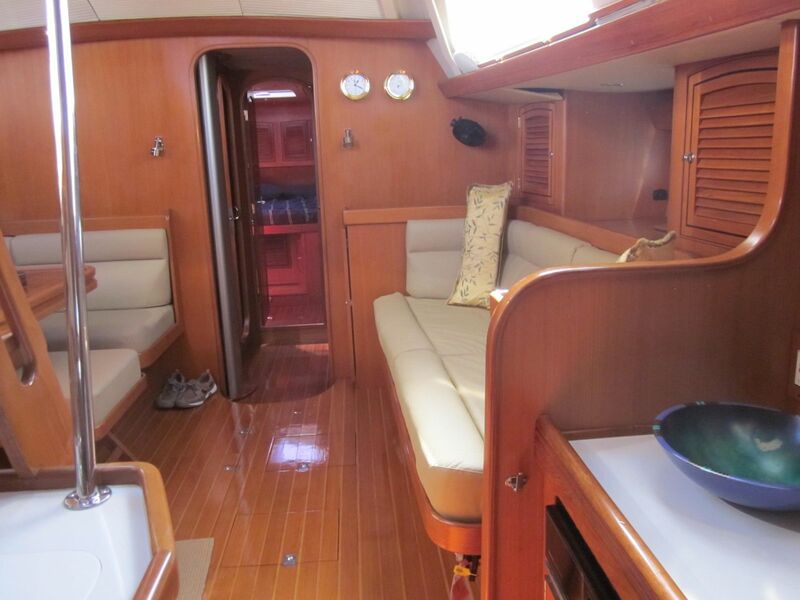 No Name is a highly customized, exceptionally well equipped 2009 Hylas 54 Raised Salon, and the newest Hylas 54 on the market. 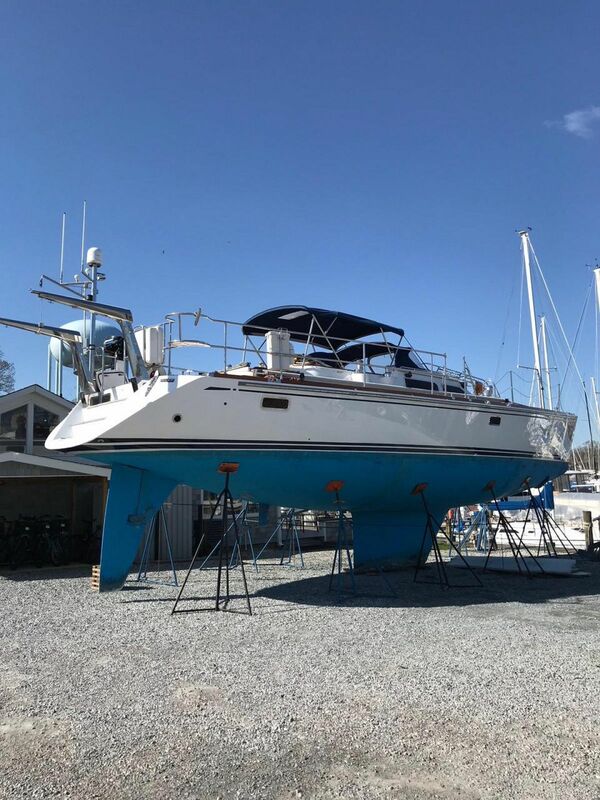 She has AN ENTIRE NEW PAINT JOB, AND FRESH BOTTOM. 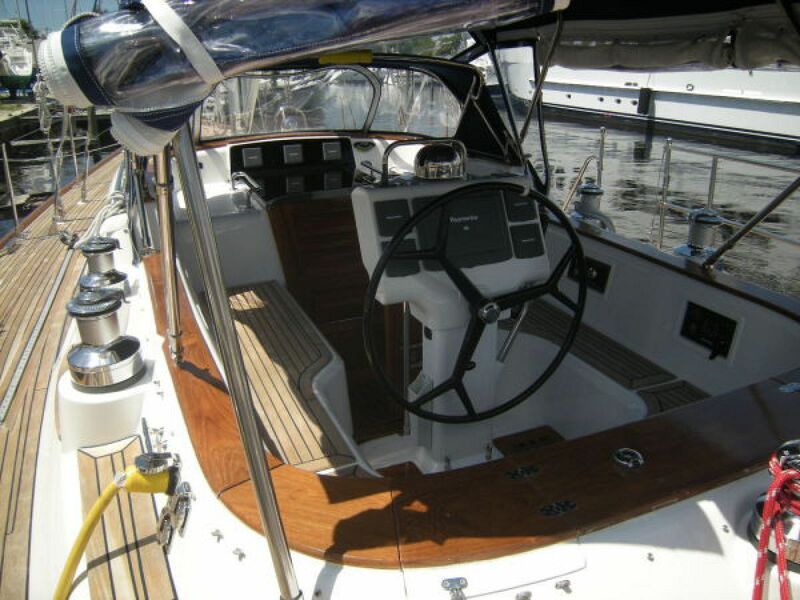 She's an excellent example of what a quality contemporary performance blue water cruising sailing yacht should be, offering comfort, safety, speed and exceptional strength and finish. She was designed by German Frers for world cruising and built by Queen Long, one of the world's premier quality semi-custom builders. The hull is classic Hylas white with a blue boot stripe. No Name was built for a highly regarded architect who was intimately involved with the builder in pre production build specifications that included many custom design upgrades and additional builder options. Examples of extensive customization are a second guest head forward, raised panel woodwork with ebony inlays, bureaus in the master suite, headliners and dining tables. On deck there are 14 custom cleats, redesigned pedestal/console and the aft stanchions have been extended forward to the gates. 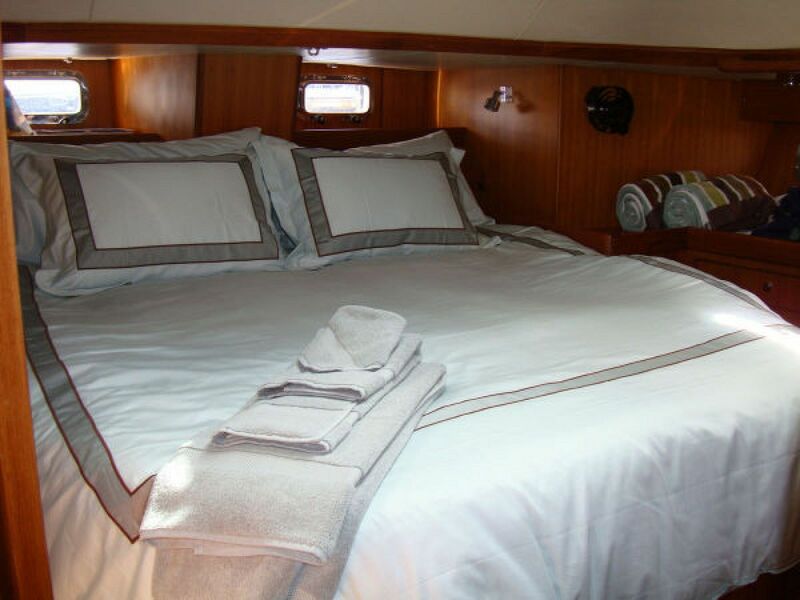 No Name offers a spacious three stateroom interior arrangement with large aft master with en suite head and stall shower and two guest cabins forward each with ensuite head and direct access to the shower stall. 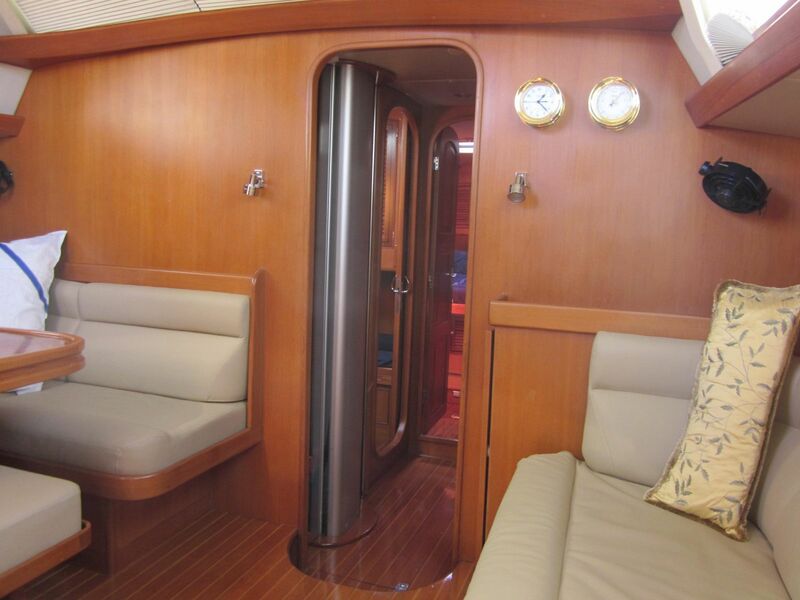 The full beam VIP forward guest cabin can be set up for two and with a filler insert becomes a queen.This cabin has its own private entry door to the forward head. 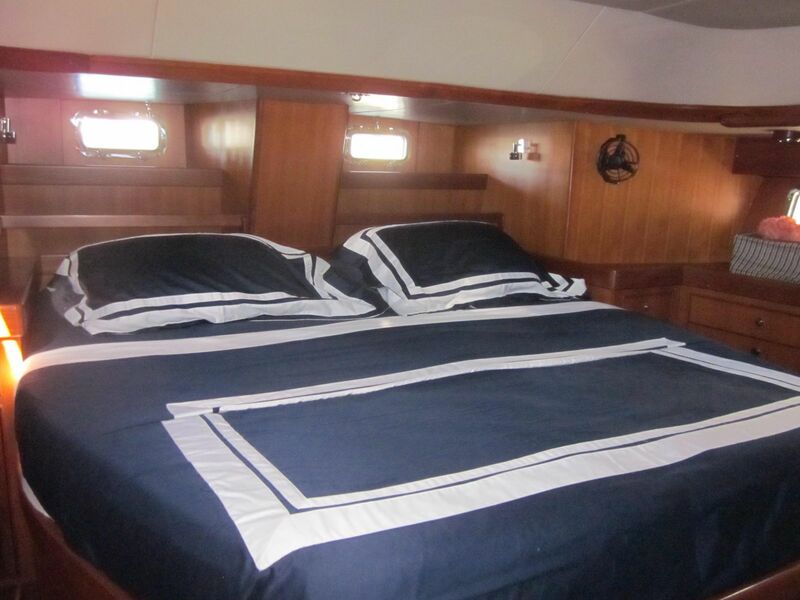 Aft to port is the second guest cabin with upper and lower berths. The 11' long passageway style galley and large navigation center leads forward to the spacious, bright, airy amidships raised main salon. The raised salon upgrade provides more natural light and better visibility from 4 side and 3 forward windows. The exquisite satin finished varnished teak cabinetry includes custom inlays and many additional storage drawers and cabinets. The cabinetry is louvered style throughout. The cabin sole is solid teak with holly inlays with gloss varnish finish. There is substantial additional storage under the cabin sole panels with lockdown lifts. All interior cabins are climate controlled (heat and air conditioned) with reverse cycle units. 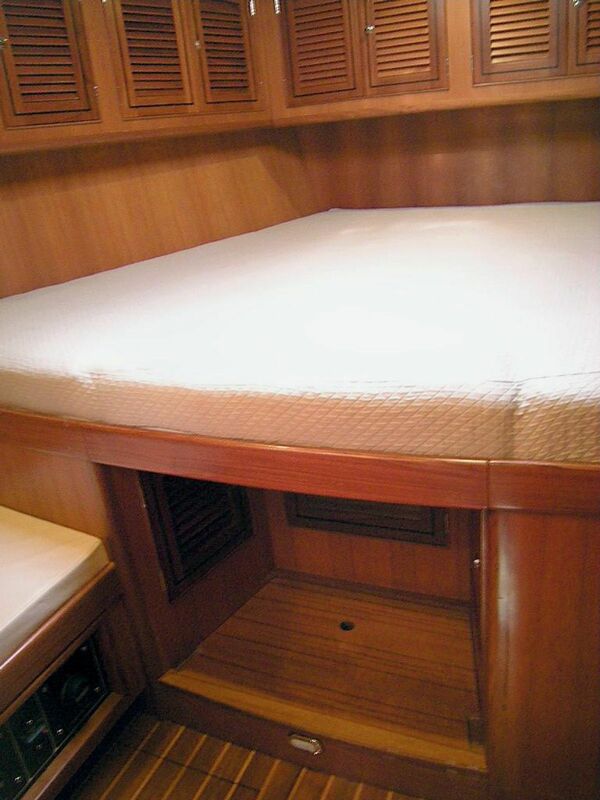 All deck hatches have Ocean Air combination screen and shades. 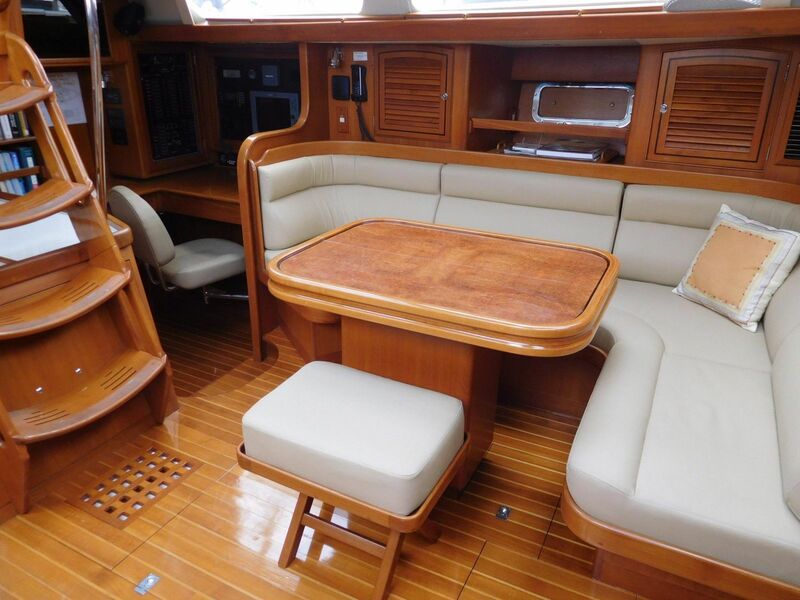 New (2013) main salon ultra leather upholstery including "L" shaped settee to port and straight settee to starboard. Amidships is a large, bright, raised open salon with comfortable U shaped settee to port with straight built in settee to starboard and expandable dining table with burled top. Soft goods include new (2013) ultra leather salon cushions. 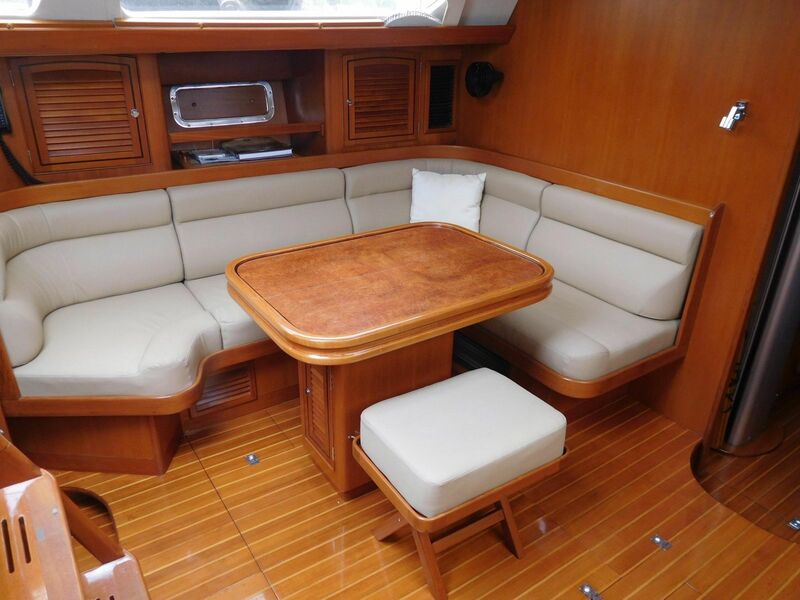 There are multiple storage compartments under and outboard of the port settee and two custom fold up chairs on the inboard side of the table. 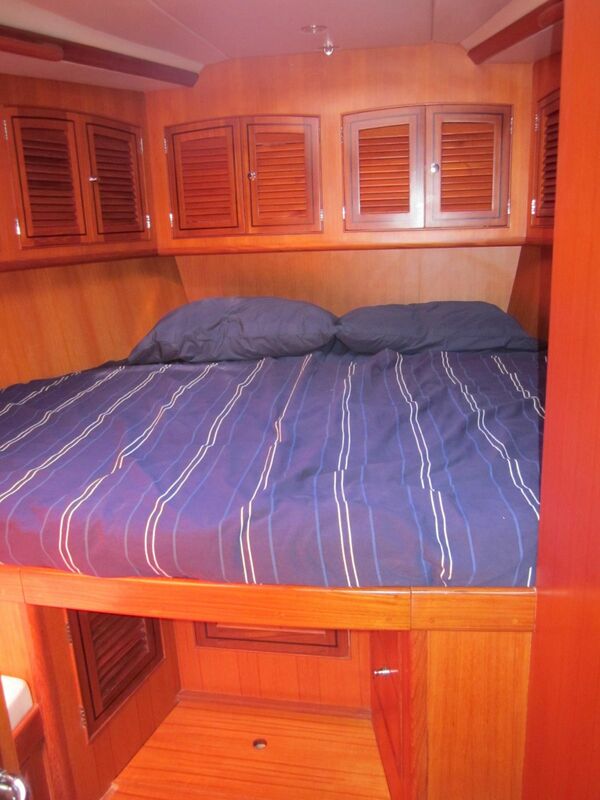 In addition there are four shelf lockers and a recessed bookshelves outboard, two port and two starboard. One locker has been converted to a liquor locker. 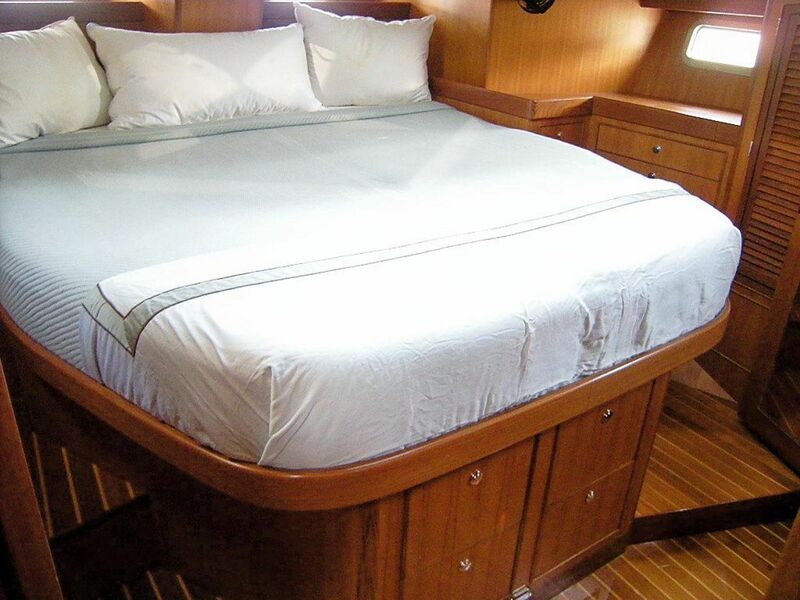 Two deck hatches with Oceanair acreen blinds provide lots of light and fresh air and all fixed ports have custom blinds and valance for additional light on both sides. A TV lift allows the flat screen to be stored when not in use. 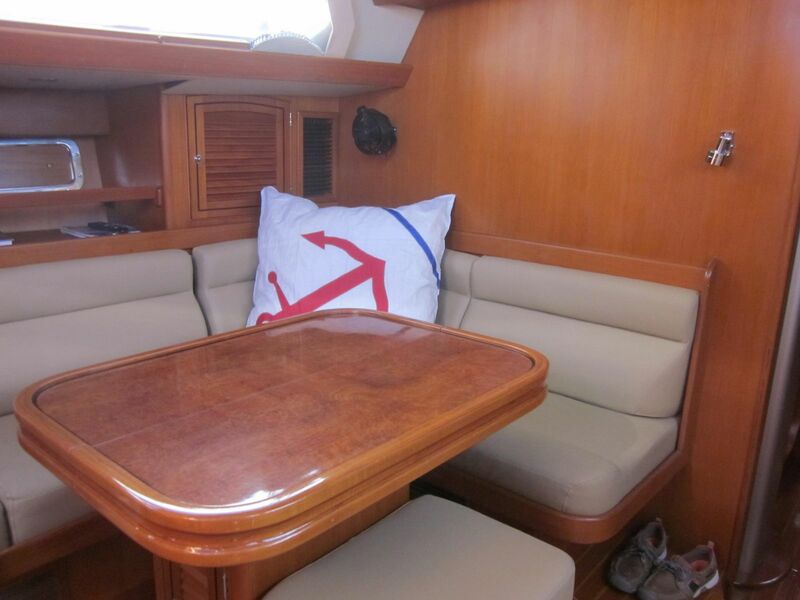 Port and starboard settees are the more comfortable squared off design. 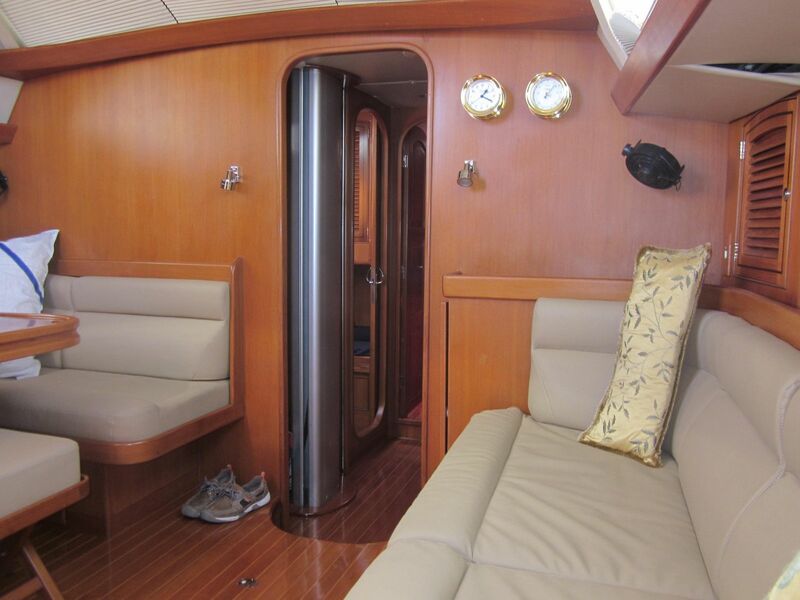 The VIP forward cabin features a large V berth with adjustable seat filler that is raised to convert berth to a queen. Lockers and cabinets are louvered with an ebony inlay. 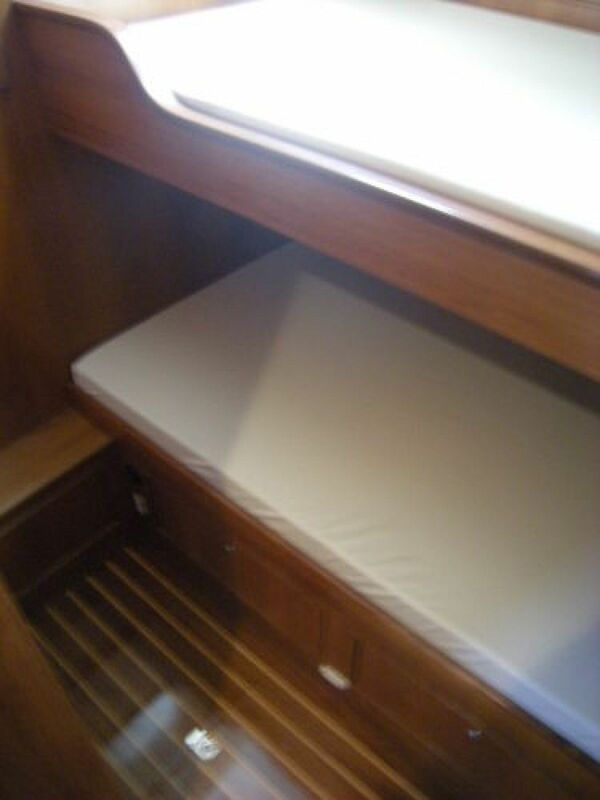 Storage includes hanging lockers, drawers, custom shelf lockers and storage under the berth and seat. 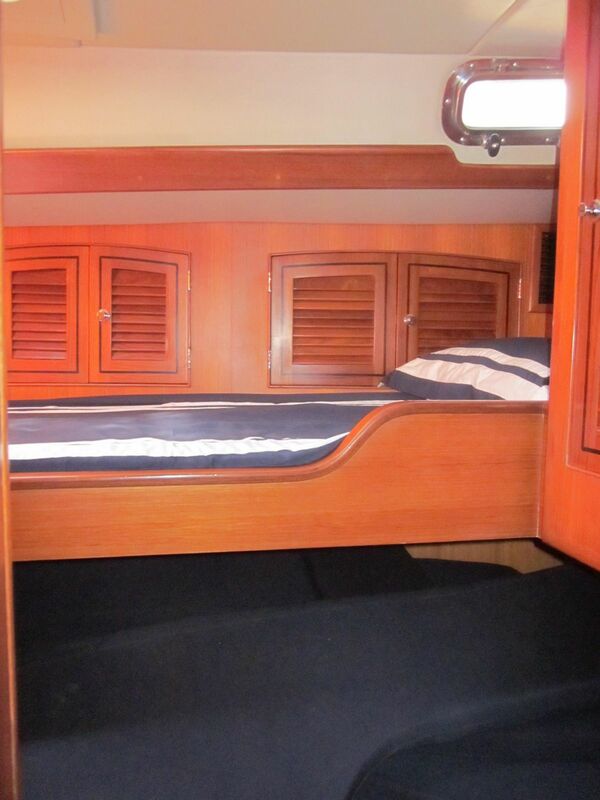 The second guest cabin has upper and lower berths. 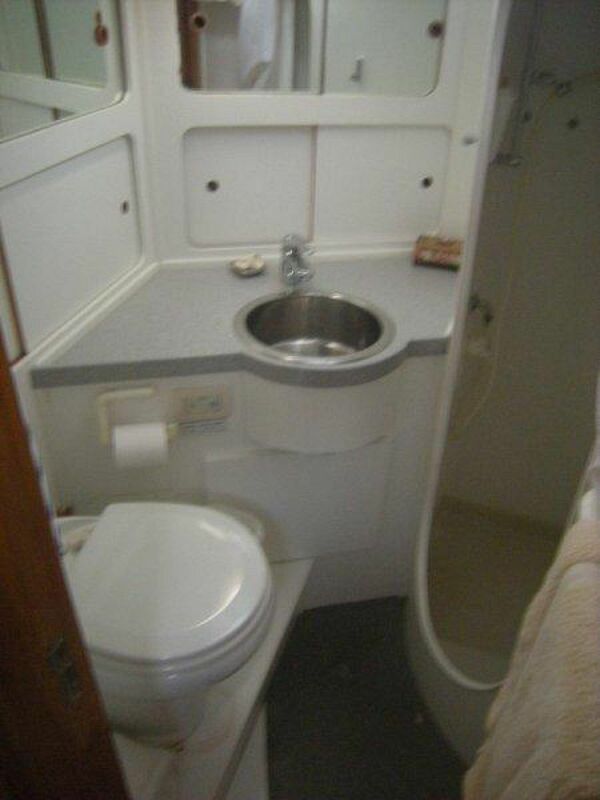 The lower berth can be pulled out to form a double berth. The space between lower berth and inboard bulkhead was designed wide enough to accommodate stowing the folding main saloon bench seats. 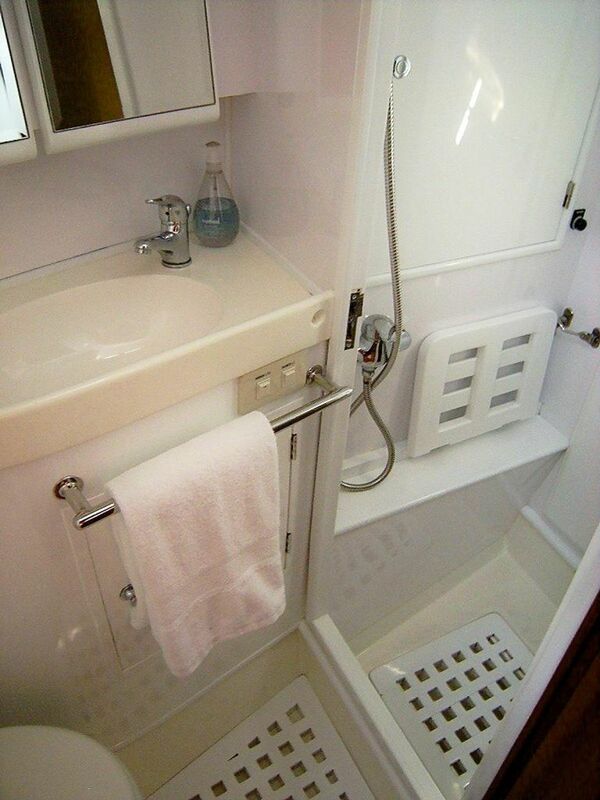 Two guest heads with shower between, one with with access door directly from forward stateroom. The second guest head door opens to the passageway. 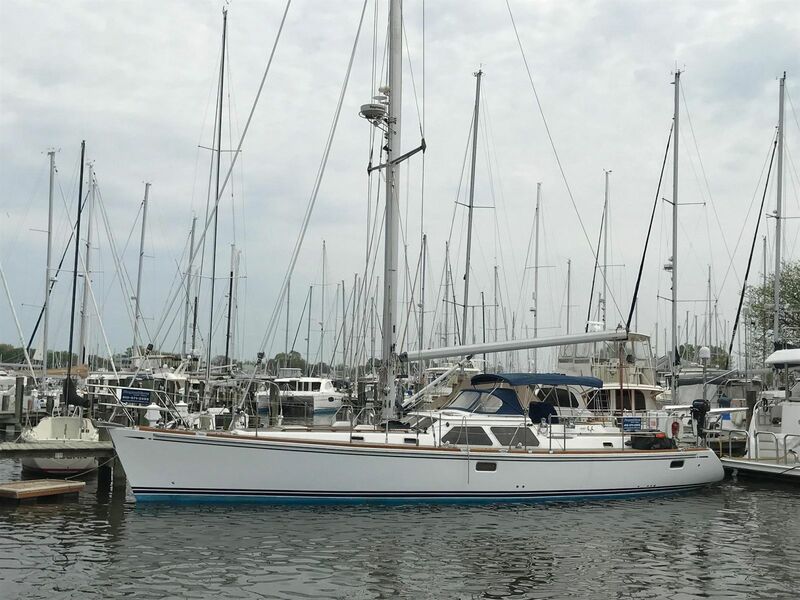 (This is the only Hylas 54 with two guest heads). Both heads are customized with all white finish, including the floor grating and manual heads. 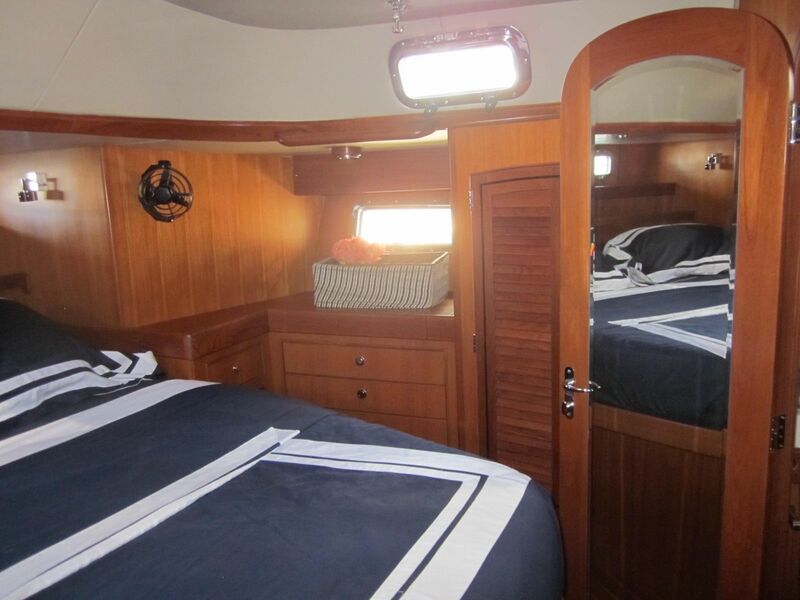 The spacious full beam aft master suite with centerline berth is accessed from the passageway galley. 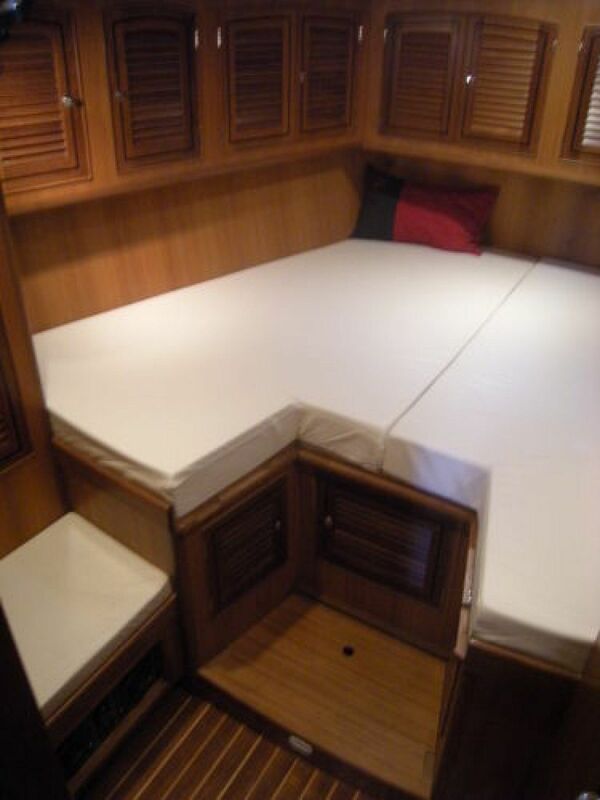 Customizing includes two additional drawer banks port and starboard, custom spring mattress in lieu of foam mattress, deeper port and starboard hanging lockers and vacuflush head. 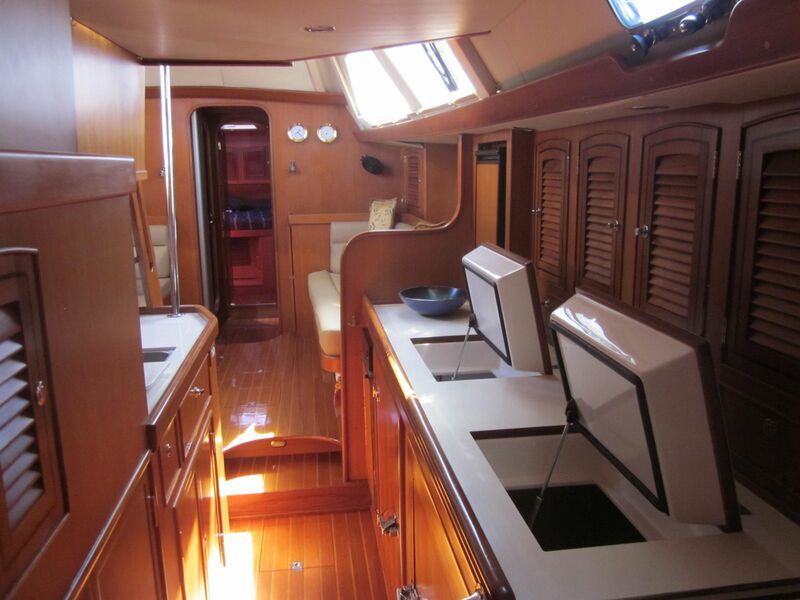 Impressive 11' passageway galley with custom Wahlee stone (similar to Corian) countertops. 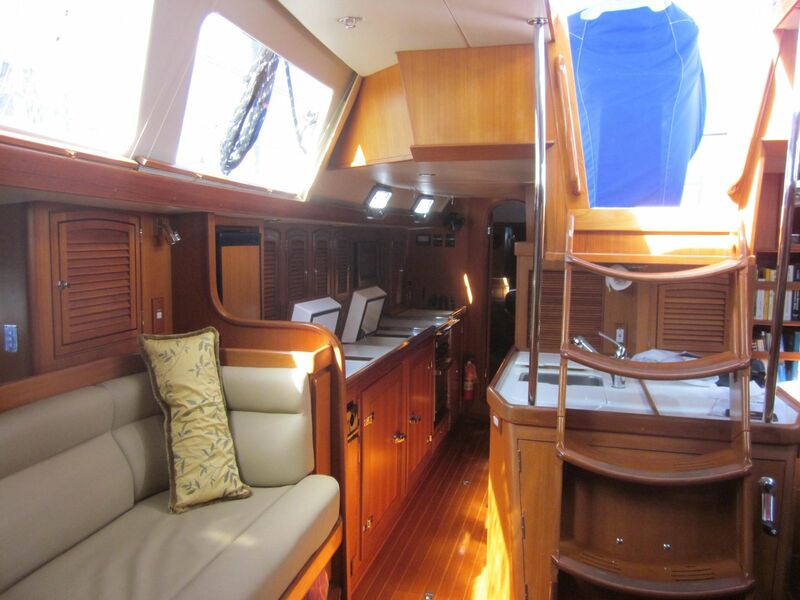 The galley aft of the salon to starboard, is very secure in a seaway, and provides exceptional storage. Storage includes many lockers and drawers above and under counters. Below the inboard counter there are multiple well insulated doors to access the main engine. There is an additional hinged front opening door and port side doors to access the machinery. The galley provides the new generation larger refrigeration and freezer boxes, each with top and front loading, total capacity 7.78 cu ft and 7.41 cu ft respectively. 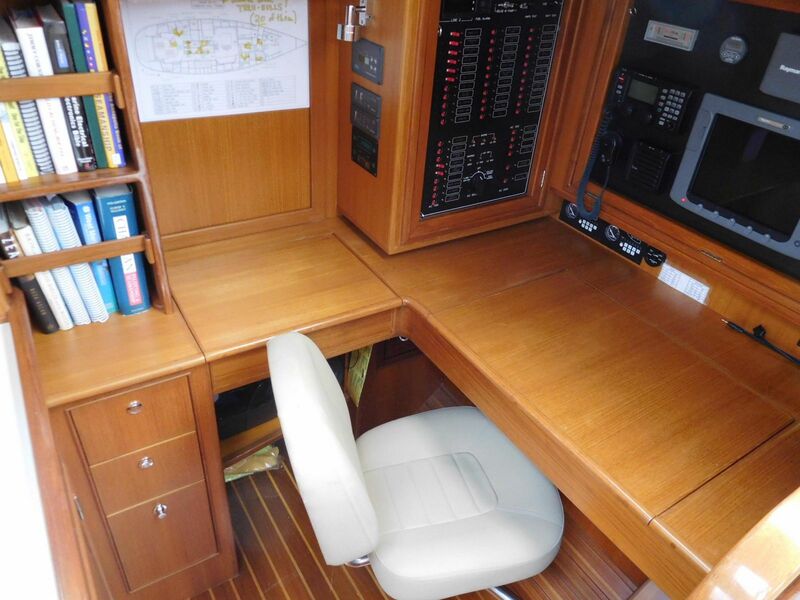 Preferred L-shaped navigation station with outboard facing full size navigation table with storage under, swing out seat, drawer bank and inboard facing computer desk with additional drawers and storage shelves. All instruments and systems are integrated, well labeled inside and out and traced numerically. 12 volt DC and 110 volt AC 60 cycle electric systems. Impressive AC and DC breaker panels with volt, amp and condition monitor gauges. Many switches and breakers were relocated to ensure they could be easily seen and operated. US and European shore power connections to accommodate 220 volt 50 and 60 cycle AC power input. Split breaker instrument panel with fast pin for instant access to wiring harness breakers and connections. 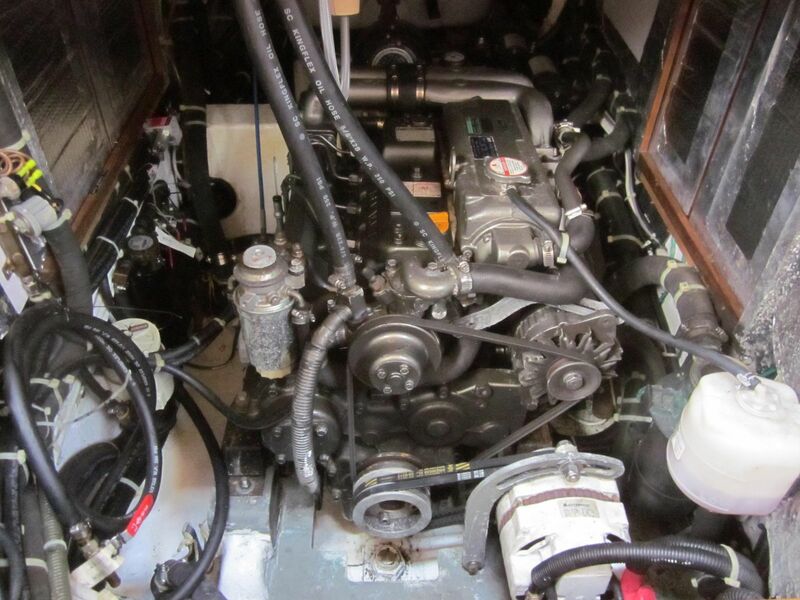 The mechanical and electrical systems offer maximum redundancy and versatility for sailing in any part of the world, including the US, Caribbean and European waters. The systems also provide ease and flexibility in using and maintaining equipment including communication and entertainment at dockside or at anchor. 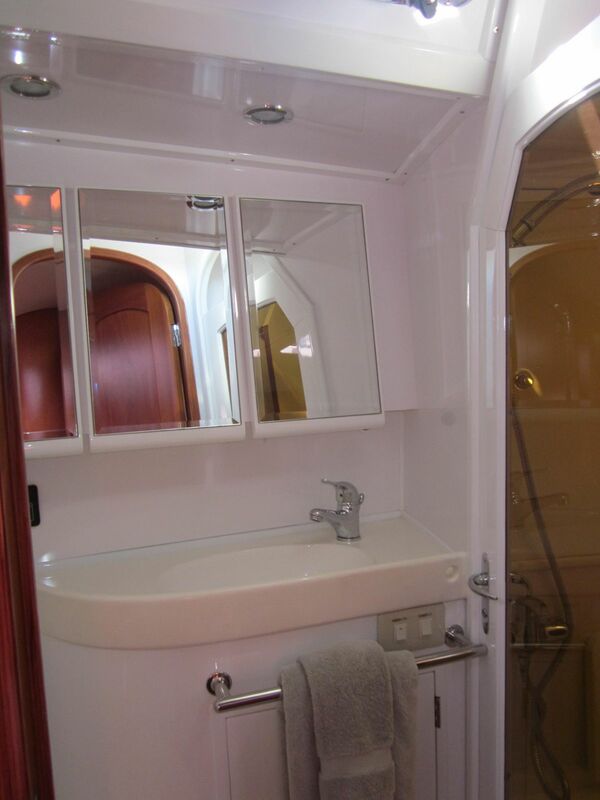 The engine room can be accessed by multiple sets of double doors on each side and a wide swing out forward door. 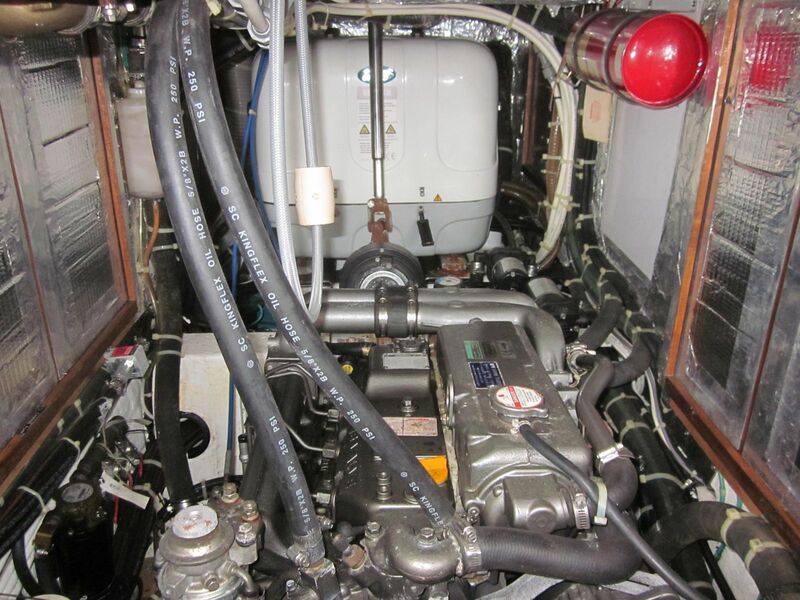 4JH4-HTE 125 hp Turbo Yanmar. Solid fiberglass hull construction Twaron (a carbon aramid fiber) reinforced hand laid with no core and using vinylester resins and Isophthalic gel coat. 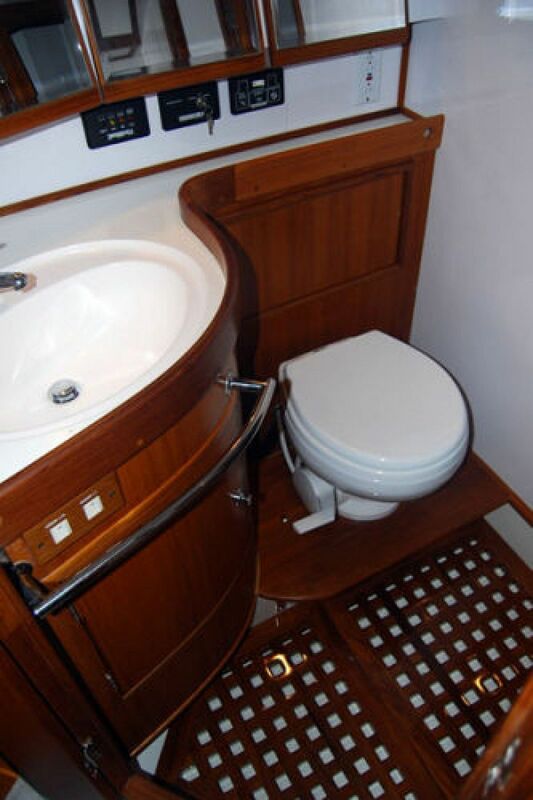 Watertight collision bulkhead forward of forward cabin with independent overboard drainage. 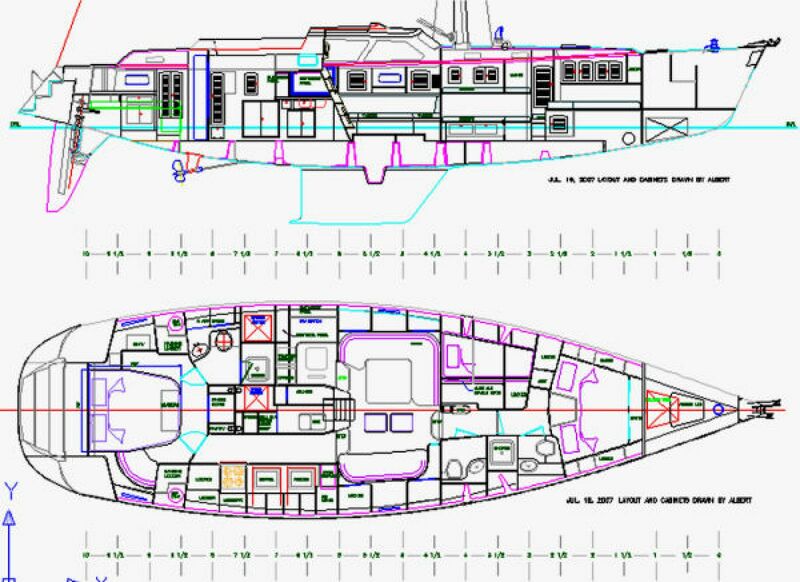 Watertight stern sections across aft lazarettes and stern locker. Molded fiberglass sandwich deck construction. 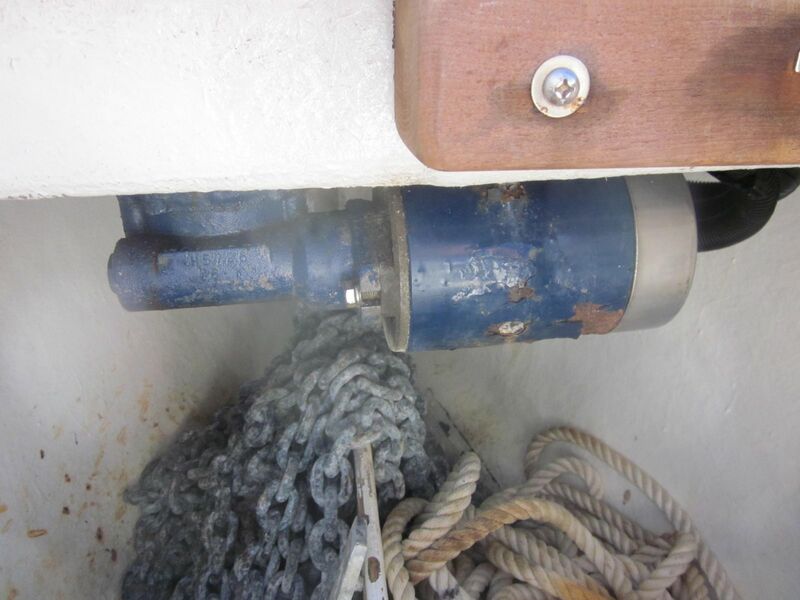 At the bow are double anchors, an electric windlass, a very large sail locker and anchor chain locker. 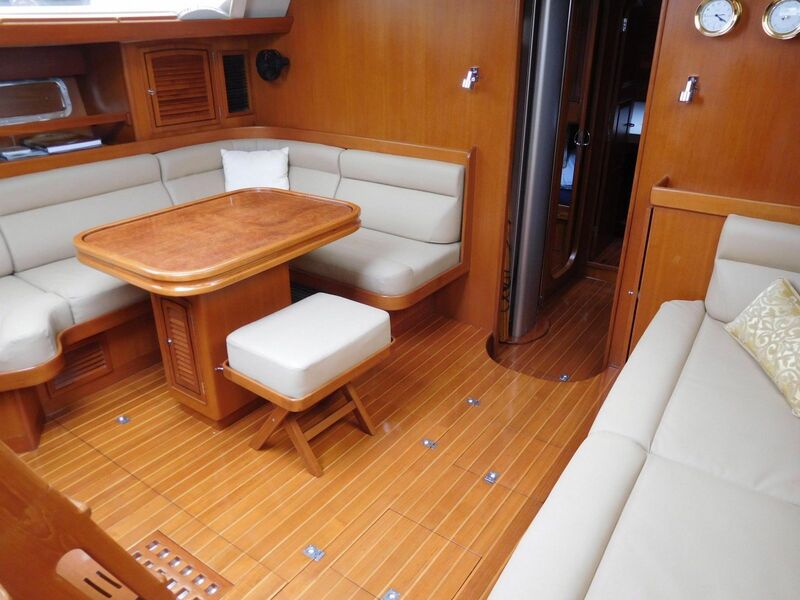 The spacious cockpit contains U shaped seating with very comfortable seat and backrest cushions and a solid teak varnished table with two fold down leaves and teak drink holder. 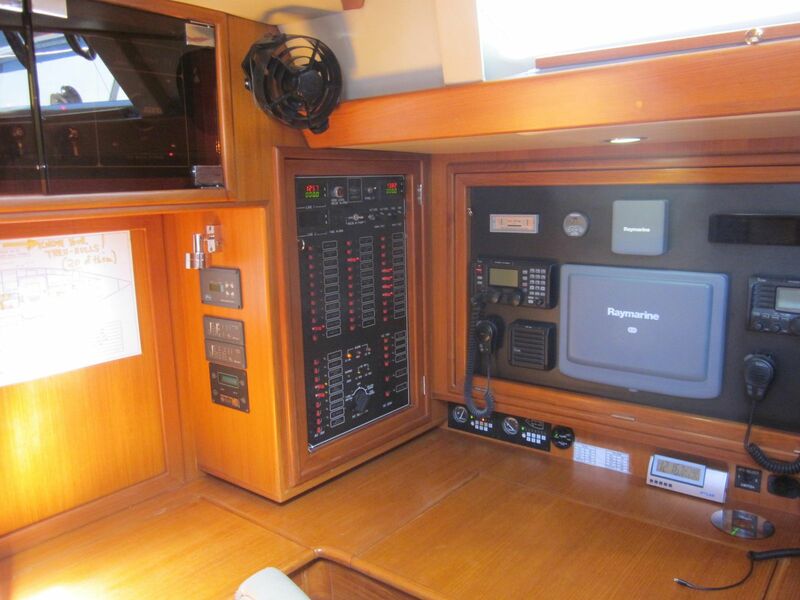 Impressive custom pedestal/console designed by the first owner, includes custom switch panel that allows for monitoring engine navigation instruments and on deck equipment and lights. Stainless radar SATCOM GPS stern pole 7 1/2'. Pole has outboard swing out lift. NO NAME is a cutter rigged sloop with Selden triple spreader annodized aluminum stoway mast. The modern cutter sail plan provides a wide range of selections to fit all sailing conditions. 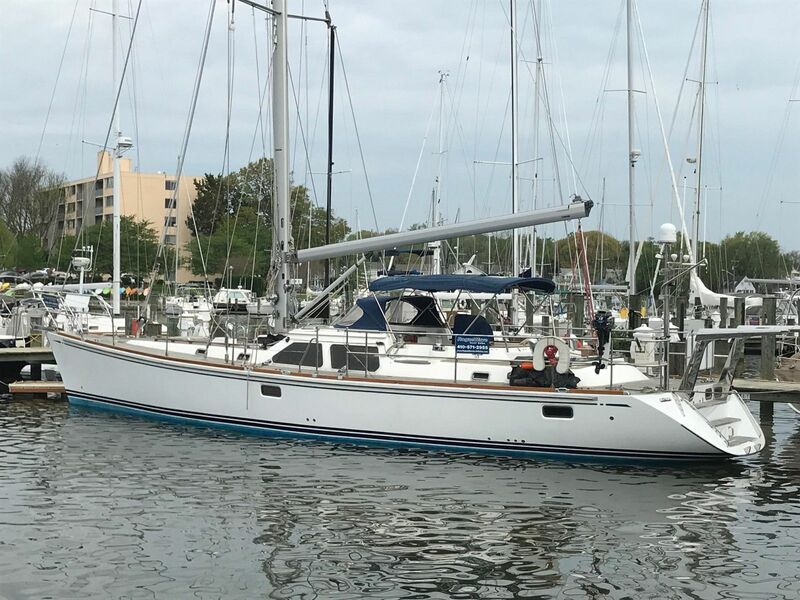 Ease of operation is provided by electric main genoa and staysail furling Thoughtful leads of sheets and halyards hydraulic mainsail, staysail and headsail furling. APC spinnaker - 1.5 oz. nylon, with ATN sleeve, X 3/8 specially designed portraying a flying Canadian Goose the width of the spi. An Operations Manual, all equipment and instrumentation original documentation is available. 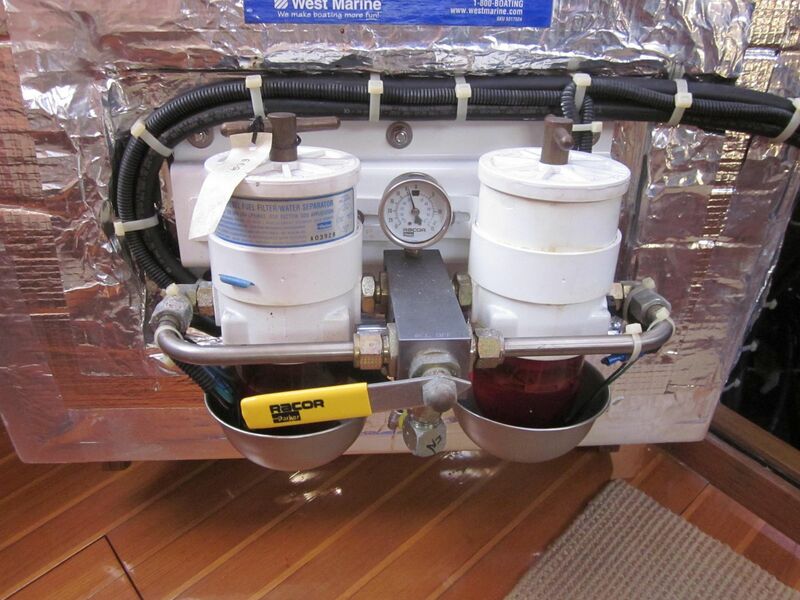 All wiring and plumbing diagrams are up to date and available.